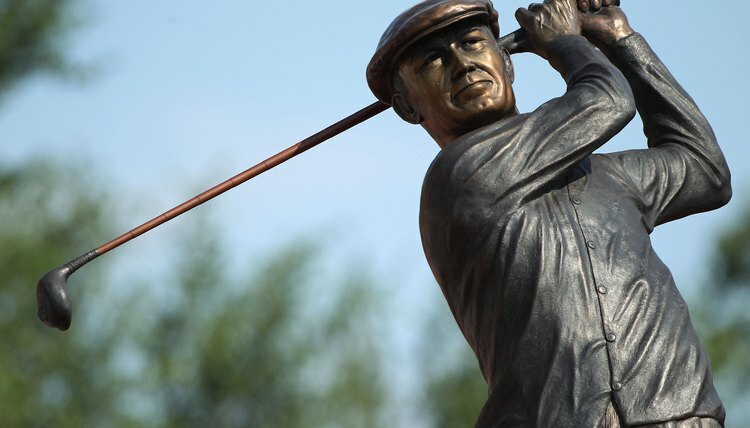 It's hard to go wrong when your golf advice comes another golfer memorialized in bronze! In his 1957 book “Five Lessons: The Modern Fundamentals of Golf” Ben Hogan presented his ideas about the essential elements of a proper golf swing. He condensed five concepts into individual lessons that addressed grip, stance, backswing, downswing, and finally the entire swing process. Many modern instructors believe that the book was a groundbreaking work that is relevant today, but only if taken in the proper context. Hogan detailed every aspect of the grip, even explaining the significance of individual fingers. His rationale was that the grip is the one point of contact that the player has with the club, and that any deficiencies in the grip will likely manifest themselves in swing flaws. For the stance he specified shoulder-width spacing with the back foot perpendicular to the target line and the front foot pointed slightly forward for proper stability and hip rotation. To help the reader understand the swing plane, Hogan used an image of a sheet of glass around the golfer’s body. He described an orderly takeaway using the hands, arms, shoulders and hips with tension between the shoulders and hips to store energy for the downswing. He described the pre-swing waggle not as a means of releasing tension but a mini-backswing that mentally prepares the player for the shot. To Hogan the most important aspect of the downswing was the initial unwinding of the hips. The upper body, arms, and finally the hands follow in order. He stressed the importance of delaying the release of the hands and wrists, known today as lag. Hogan’s last chapter was a summary of the individual parts of the swing. He required that the arms stay close to the body until the final motion of the follow through. Hogan also believed that by hitting the ball hard a player can actually have a more repeatable as well as more powerful swing. Today’s teachers find many aspects of Mr. Hogan’s approach appealing even 50 years later. His emphasis on the grip, the introduction of the swing plane and the synchronization of movements during the downswing are still highly valued. They also address the most common problems of golfers today: gripping the club too tightly, swinging over the top and casting the club by releasing the hands too early. Some teachers also point out things to keep in mind when applying Hogan’s principles. The first is that Hogan was probably the most consistent ball striker ever to play the game, and relying too heavily on his techniques may not produce benefits for lesser-skilled players. The early unwinding of the hips for example could be disastrous to a player who doesn’t achieve Hogan’s athletic position at the top. Also, his physique was diminutive by 21st-century standards, and with changes in swings and equipment over the years, his specific recommendations may not apply quite as well for golfers today. “Ben Hogan's Five Lessons: The Modern Fundamentals of Golf;" Ben Hogan and Herbert Warren Wind; 1957. “Golf Digest;" Butch’s Basics; Butch Harmon; Nov. 2003. “Golf Digest;" Make Hogan's Magic Work for You; David Ledbetter; Nov. 2000. What Is the Correct Golf Swing Plane?